Kanaka Durga underwent a major change over the last six months after she fell into the company of some activists. “Kanaka Durga suffered injuries on her head and ear, some of them severe,” said Perinthalmanna Sub Inspector P S Manjit Lal, the New Indian Express has reported. The essence of the report is that Kanaka Durga, who was under hiding after her “landmark” entry into the holy shrine, returned home on Tuesday evening around 6 pm. Some Marxist “activists” too had accompanied her. When they reached the residence of Krishnan Unni, her husband, who works as an engineer in the Public Works Department of the Government of Kerala, was not at home as he had taken the couple’s two children to the place nearby Lord Ayyappa Temple. Sumathi (72), the frail-looking mother of Unni was alone at home and she was saying her evening prayers. When Kanaka Durga knocked at the door, Sumathi opened the door. The old woman who had reservations about the wayward life of Kanaka Durga told her to wait till Unni, her son, was not at home. But Kanaka Durga tried to enter the house by force when Sumathi blocked her way. According to Kanaka Durga, it was then the mother-in-law took out the reaper and ‘hit her on her head with all her forces’ which left her unconscious. But Bharat Bhooshan, Kanaka Durga’s younger brother had a different story to tell. 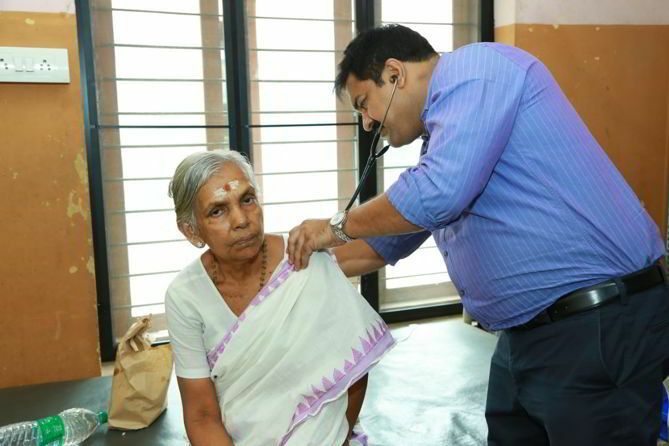 “Sumathi is very old and frail and she could not stand on her own. How is it possible for such a lady to attack Kanaka Durga, less than half her age and a strong and haughty?” he told Team PGurus. Bhooshan said he had rushed to the residence of Unni after hearing about the commotion and found Sumathi lying on the floor all beaten up by someone. “I went to the hospital and saw my sister. She is all right and does not have any visible injury marks. There is a scar on her forehead which resulted when she slipped on the floor while trying to push down Sumathi to enter the house,” said Bhooshan. The family of Kanaka Durga owed their political allegiance to the CPI-M though they were ardent Ayyappa devotees. “My sister’s husband and his family too are traditional Marxists despite being Lord Ayyappa devotees. But Kanaka Durga underwent a major change over the last six months after she fell into the company of some activists. We are in the dark about what happened to her who works as a manager in Kerala State Civil Supplies Corporation,” said Bhooshan who also disclosed that he had a chance to check the belongings of Kanaka Durga’s baggage. “The Irumudikettu contained chains which the Ayyappa devotees wear during the penance period, pictures of Lord Ayyappa and sanitary napkins which literally shattered us. We don’t know what happened to her. It seems she has fallen prey to somebody’s influence or spell,” said a worried Bhooshan. It was Bharat Bhooshan who told the world immediately after the entry of Kanaka Durga and Ammini Bindu to the sanctum of Sabarimala that they were sponsored by the Marxists as well as the Kerala Police. It was the Police which took care of their accommodation, traveling and stay during the last 40 days as part of the operation,” Bhooshan had told the media. He also disclosed that though the media was told by him that it was Kanaka Durga who attacked her mother-in-law and not Sumathi as made out by the local Marxists, he was told to keep quiet by a TV channel reporter who told him that only the news about Kanaka Durga being attacked by Sumathi made sense. 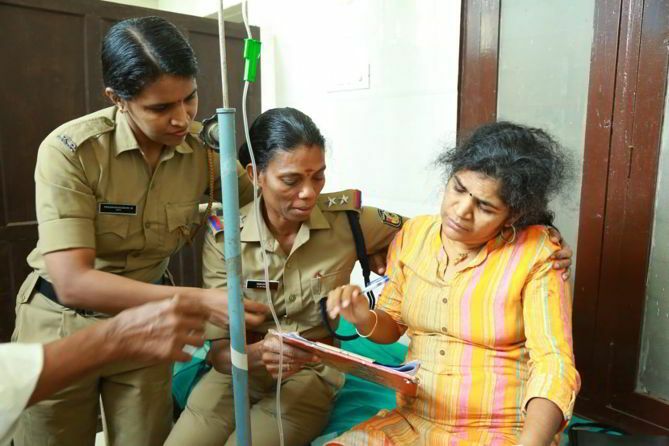 Sumathi who has been injured grievously has been admitted to Perinthalmanna Government Hospital where she is undergoing treatment. But the CPI-M dominated Kerala Police has registered a criminal case against Sumathi under sections 341 and 324 of the IPC for attacking their comrade. 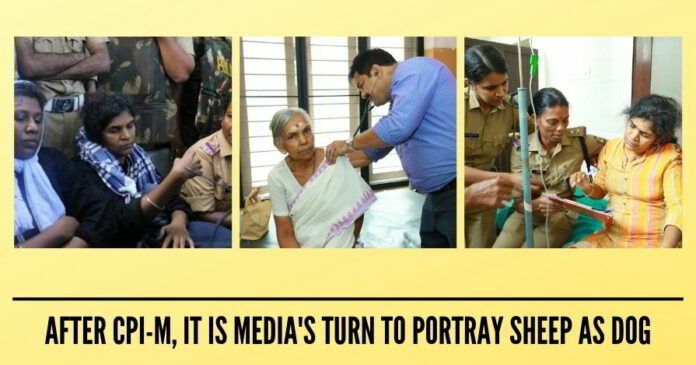 Team PGurus is attaching pictures of Sumathi who has been hospitalised and Kanaka Durga who herself got admitted to the hospital. The photographer was telling us Kanaka Durga who was in a buoyant mood turned lugubrious and began acting as if she was under severe pain. “Sumathi was her natural self”, said the photographer. Are Hindus children of a lesser God in God’s own country? I feel sorry for the aged Mother In Law. This si the level to which the marxists rightly called as the Tukhde Tukhde gang can stoop to. What shall go shall come back to haunt soon. Let them not be carried away by their heroic deeds, an insult to the Lord shall not go unnoticed and somewhere this KanakaDurga will repent. But the Kerala government should be just thrown out of power if the Hindus have to live with dignity.